Knowing your user’s location is useful information in many applications we develop and use today. There are a lot of popular location-based applications out there that are making our lives easier, as well as changing the way that we use these services. An example is the wildly popular application Foursquare, where users who frequent to an establishment and “check in” often win discounts. Uber, which helps you get a ride from your mobile phone at a lower rate than a normal taxi. The list is large and still growing. In this article, we are going to build a simple Android application to determine the user’s latitude and longitude using Android’s Google Location Services API. 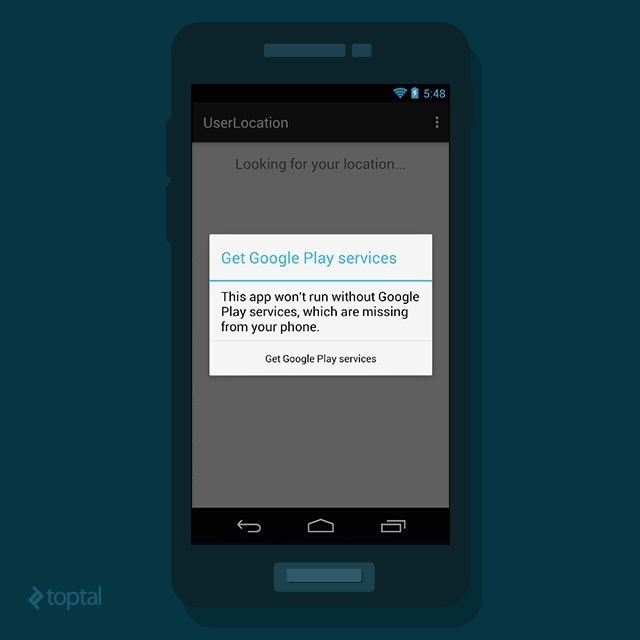 When developing Android applications, there are a couple of ways to get the user’s location. The package “android.location” has been available since Android was first introduced, and it gives us access to location services. These services allow applications to obtain periodic updates of the device’s geographical location. LocationManager.GPS_PROVIDER: Determines location using satellites. Depending on the conditions, this provider may take a while to return a location fix. LocationManager.NETWORK_PROVIDER: Determines location based on availability of nearby cell towers and WiFi access points. This is faster than GPS_PROVIDER. When you are looking for user location you have to play with these providers and their availability. Ideally you obtain the first location using NETWORK_PROVIDER, which might not be as accurate, but is much faster. You might then make an attempt to increase accuracy by listening for a better location fix using the GPS_PROVIDER. The APIs provided by this package are fairly low-level, and require the developer of the application to handle the finer details of determining when to request location data and schedule calls to the API in an optimized way. To improve developer experience with location based system services and ease the process of developing location-aware applications, Google introduced a new way of requesting a user’s location using Google Play Services. It offers a simpler API with higher accuracy, low-power geofencing, and much more. Simplicity: Unlike the previous API, you no longer have to deal with multiple providers. Instead, you specify high-level needs, such as “high accuracy” or “low power”, and it will take a suitable approach. Availability: Gives your app immediate access to the best, most recent known location. Usually this information is readily available, you just have to ask for it. Power-efficiency: Minimizes your application’s usage of power. Versatility: Meets a wide range of needs, from foreground uses - needing highly accurate location data, to background uses - requiring only periodic location updates with negligible power impact. Let us build a location-based Android application using this API. For this, we will use Google’s suggested IDE for Android application development - Android Studio. Getting started with Android Studio is pretty straight forward. Their website describes the procedure involving the installation and configuration of Android Studio in great detail, including how to bootstrap your first Android application for development. At the time I am writing this article, the latest version of Google Play Services available is 6.5.87. Make sure you always check for the latest version available before you start. In case newer versions comes out later down the road and you decide to update it for your own projects, test all location related features against all versions of Android you are supporting. At this point, we should be able to start doing the actual work for our application. Before accessing features provided by Google Play Services, we must check if the device has Google Play Services installed, and that the version is the one we intend to use (6.5.87). This method will check for Google Play Services, and in case the device doesn’t have it installed (it’s rare, but I’ve seen such cases), it will open a dialog with the corresponding error and invite the user to install/update Google Play Services from the Google Play Store. This callback is fired when Google Play Services is connected, which means by then we should have the last known location. However, this location can be null (it’s rare but not impossible). In that case, what I recommend is to listen for location updates which will be covered next. After you invoke “getLastLocation”, you might want to request periodic updates from the Fused Location Provider. Depending on your application, this period could be short or long. For instance, if you are building an application that tracks a user’s location while he drives, you will need to listen for updates on short intervals. On the other hand, if your application is about sharing user location with his friend, you maybe just need to request the location once in a while. We instantiate a new LocationRequest object. Set the interval to 20 seconds (20000 milliseconds). Furthermore, we set a throttled update rate to 5 seconds. This tells the API to provide updates every 20 seconds (preferably), but if there is a change available within a 5 second period, it should provide that too. Finally, we set the priority to “PRIORITY_HIGH_ACCURACY”, among the other available priority options: PRIORITY_BALANCED_POWER_ACCURACY, PRIORITY_LOW_POWER, PRIORITY_NO_POWER. As you can see, the fundamental ideas behind implementing location aware applications in Android is very simple. 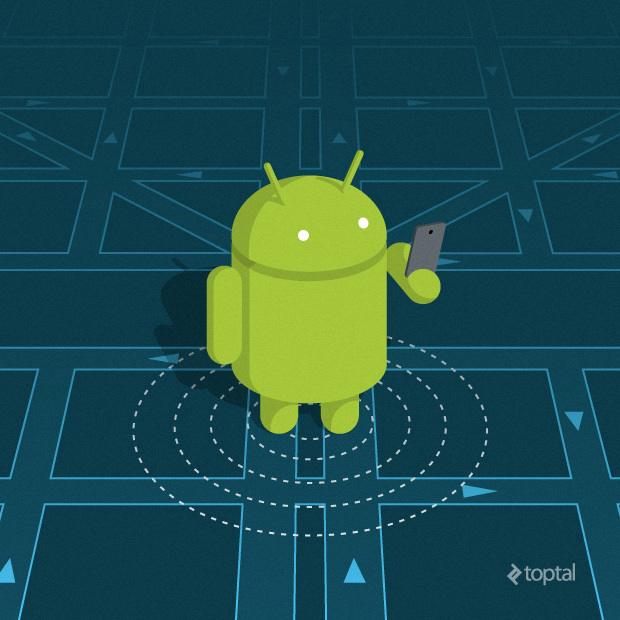 Moreover, with the available APIs that are both simple to use and easy to understand, it should be a no-brainer to build basic location-based applications for Android. The small sample application we have built here is meant to demonstrate exactly that. You can find the complete source code for this on GitHub. Please note that to keep things simple, the application is not handling the “onConnectionFailed” callback method. Hopefully this tutorial will help you get started with using the Google Location Services API. Nice info... i really like it, and its not a crime to use a example from internet abbiya. Have a nice day. great job! Thanks for this article. Inside a fragment where should I call every method? Thanks for nice tutorial. Described in a simple and straight way. I know, right. LOL! I can't find anything on the internet that actually works. Not even developer.android.com guides, YouTube videos, etc. Thanks, really helpful. Solved my location awareness application problem. I'm facing the same problem here. It is almost impossible to find A GOOD EXAMPLE of how create a service that must run in background and receive location updates. Also, all example on developer.android.com are terrible, any one of them really works. I recommend buying a book or borrowing one from a library, which is will most likely be too old by now. The book that I borrowed was published in 2012. If you have some money, you can buy a course online. shouldn't you initialize the GoogleApiClient in onActivityResult as well? I feel like you'd be getting a null-pointer in the case that the user didn't have a valid google play services package installed, or am i missing a concept here? Does it run in background for updating locations? It crashes just after few moments of application launched every time. I can see the toast once after launch. Danny is a full-stack software engineer with 7+ years of experience doing project management and building web and mobile applications. He is passionate about the tech world and the cutting edge, and he's also interested in SEM and digital marketing.